Is it time to get your life back in order? Call it spring cleaning, or a hard reset. The little things, like refilling a prescription, change your furnace filter, get your car’s oil changed – or minding your oral health, by making an appointment with The Lewisville Dentist. If you’ve been pushing your six-month checkup onto the back burner, maybe it’s time to get it out of the way. Taking care of your teeth is one of the best things you can do for your overall health, since it’s well-established there there is a solid link between your general health and your dental health. 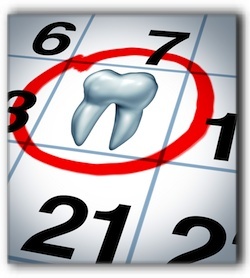 By not visiting us every six months, you’re putting your oral health at risk. A routine dental checkup can discover cavities before they become serious. A cleaning removes any plaque and tartar that has built up on your teeth. Both can lead to tooth decay and gum disease. We’ll also make sure your dental x-rays are up to date. X-rays allow us to see potential problems that may not be giving you any signs yet. It is far simpler to address potential problems early on, and it’s certainly less expensive. Here at The Lewisville Dentist we provide family dentistry services like cleanings and checkups. We also offer popular cosmetic dentistry services like teeth whitening and porcelain veneers. So move through your to-do list: change your oil, change the furnace filter, and make an appointment with the dentist in Lewisville TX.